If you can shoot 95 regularly, you have all the shots you need to break 90. By re-orienting your mental approach to the game, and making a few adjustments to how you play, you can get there. The first thing to do is start believing that you are an 80s golfer. We live up to the image we have of ourselves. Right now, your image is that the best you can do is 92. Time for a new image. Second, play every shot with confidence. Never play a shot before you feel that it will come off as you intend. Reserve a few seconds in your pre-shot routine to allow that confidence to emerge. If you can’t get that feeling, pick another shot or play the ball to a different spot. Because half of good golf is wrapped up in how you use your mind, you’ll need a solid mental game to see the course clearly, choose the right shot, hit it with confidence, and stay composed throughout the round. Play every hole with a plan you have worked out before tee off. Your days of hit-and-hope golf are over. You plan is, which combination of shots can you hit, and to where, to get the ball near or onto the green quickly? A typical par-5 hole runs 485 yards. Say you put your drive in the fairway 225 yards out, leaving 260 yards to go. Why hit your fairway wood next, which is a difficult stroke to play? Try covering that distance with two 8-irons. Much easier. If you’re playing a difficult par 4, maybe you could lay back and play it as a par 5 so the ball is always in play, making each stroke a comfortable shot instead of reaching for something you seldom produce. On long par 3s, consider playing short of the hazards around the green, and chip on for your bogey, or a par if it works out. Avoid the double, because they’re easy to get on these holes. Remember that you don’t have to play for par on every hole. Lots of bogeys and a few pars will do nicely. Off the tee, unless you’re very good with your driver, leave it at home. To break 90 you have to get the ball to the green as fast as you can. Chasing down errant tee shots is not the way to do that. When you get onto trouble, chip out, then continue down the fairway. That will cost you one stroke. Hitting your fairway metal because you’re 230 yards from the green, ignoring the fact that the ball is in calf-high weeds, will cost you two or three. You no doubt miss a lot of greens, so hit your short shot to get the ball on the green inside two-putt distance. Just get it on the green in one shot, and close enough. Don’t ask anything more of your short game than that. Another mental skill: it’s time to become a forgetter. Forget about the bad shot you just hit. Forget about the bad scores you made on prior holes. Hanging on to them makes you think they have ruined your chance to shoot a good score. You’re going to make mistakes and have bad holes. Just don’t think that you can’t make any mistakes, or that making one or two sinks the round. This post is not: what I think the best equipment out there is. This post is: how to get the most appropriate equipment for your game. One thing about golf is that it offers more equipment options that any other sport. If you play softball, for example, you need a bat and a glove, and even a novice could find ones that fit after a few minutes of looking at the local sporting goods store. Golf? There are enough different clubs and balls out there to confuse even an experienced golfer. Here’s how to find the equipment that is best for you. Let’s say you’re just taking up the game. Borrow a set of clubs. Hunt the thrift stores to find a set with a bag. It doesn’t matter that much, really, what you come up with, but get a few woods, some irons, and a putter. Go to the local variety store and buy some golf balls that cost about $15 a dozen. That will be all you need to start playing golf to see if you like it. If after a few months you think golf is here to stay, then you definitely need better equipment. You could buy a set of used golf clubs from a pro shop or second-hand sporting goods store, or you could buy a new set. The used option would be cheaper, about half the price of a new set, and would be satisfactory until you decided to make a commitment to golf as your pastime of choice. If you decide to go new, stick with the major manufacturers. The quality of their clubs is guaranteed. Other manufacturers make what are called “knock-offs,” which are clubs designed only to look like a major brand. Their playability and durability are poor, and they are a waste of your money. About half the name brand clubs sold over the Internet are counterfeit, according to one pro shop owner I talked to. Buy from a pro shop or a reputable sorting goods store. Also, have a fitting when you buy new clubs. As for golf balls, there’s no reason to play one of the high-end balls that professionals play. It takes a much higher swing speed than the large majority of recreational golfers have to take advantage of the ball’s design. Stick with a ball in the $25/dozen range. Golf balls come in three basic types: distance, accuracy, and spin. A distance ball will go farther, but only 5-7 yards at best. Accuracy balls spin less and thus go straighter, but they won’t cure your slice. Spin balls, also called tour balls, stop faster (run less) on the green, but their higher spin rate might exacerbate your slice. Buy a box of three of each kind of ball, play a round with each, and stick with the one you like the best. That’s really the only way to decide. So far, you have a set of irons and some golf balls. You still need a putter, some wedges, and a driver (maybe). First, the putter. About one-third of your shots will be played with this club, so you should definitely get one fitted when you buy it. There are so many design schemes, the only thing you can do is try one of each to see which one feels best in your hands, gives you confidence over the ball, and is easiest to swing. Appearance is important here. If the appearance of a putter is distracting, don’t buy it. You should have a sand wedge in the 54- to 56-degree range. This club is designed not only for escaping bunkers, but for pitching onto the green from shorter distances. The question of how many wedges you should carry is the subject of another article, but a sand wedge, in addition to the pitching wedge that comes with your set of irons, will be enough for most golfers. Now, the driver. Most recreational golfers should not have one. This is a difficult club to hit, and it creates more problems than it solves. Instead, buy a 14-degree fairway wood and use that off the tee. You will get all the distance you need, and hit the ball into many more fairways than you ever will with a driver, at least until you become a very good player. Many golfers, including touring professionals, complain that they can’t take their range game to the course. They hit the ball just fine on the practice ground, but their efforts are lost by the time they get to the first tee. The reason for this is simple. The formula is backwards. Golfers should be taking their course game to the range. What I mean is you have to play the same way in both places. The practice tee is the place where you teach yourself to hit good shots on the course, when it counts. You won’t achieve that goal unless you also simulate the playing environment as closely as you can. Now you can’t bring a golf course and all its hazards and distractions to the range, but you can bring your mental responses to them, and train your mind appropriately. Here’s what usually happens during practice. You hit one ball after another. Pretty simple. Even though you do that to perfect a particular technique you are working on (and there should be one, otherwise why are you out there? ), it’s not difficult to hit a string of good shots when you hit them with the feeling of success fresh in your mind. On the course, where you don’t get to swing but every five minutes or so, your true skills emerge. Part of being disappointed about not taking your range game to the course is that the range game you take to the course might not be as good as you think it is. The other thing the practice tee does, and this is even more insidious, is devalue the worth of a golf ball hit. There’s no penalty for a bad shot, and you can hit as many more balls as you need to get it right. On the course, you have one chance, one, to hit the shot you want. That’s not much pressure, really, but it’s more than you have in practice. So let’s try three things that get to both issues. 1. Never hit the same shot twice in practice. If you’re practicing a swing technique, switch clubs and aim to a different target with each new ball. Practice the technique by taking as many practice swings as you need, to feel you are performing correctly, but then step up and hit a golf shot, not the merely another ball. Same goes for around the green. Hit the 25-foot approach putt, but if you leave if four feet short, hit the four-footer instead of bringing the ball back to try again. What you leave yourself on the green in practice is what you’ll leave yourself on the course. Learn to deal with your mistakes. The same goes for chipping. Chip once, putt it out. This will give you real incentive to chip them closer. 2. After you hit a ball, pull over another one and step off the mat, or step behind the ball on a grass tee. Get ready just like you would on the course. Pick a target, figure out what shot you’re going to hit, get your mind ready, go through the rest of your pre-shot routine, and then you can step up to the ball and hit it. Don’t just hit range balls. Play golf! 3. Every so often, take a break. Stop hitting golf balls and just sit down for a while. Give yourself time to absorb what you have learned so far (practice), and to ask yourself to pull out a skill you haven’t used for a few minutes or more (play). 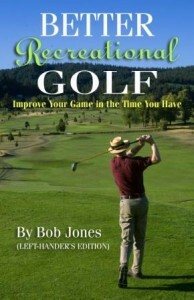 In short, the only way to learn how to play golf on the course is to find ways to play golf wherever you are. You might be interested in this one-hour practice plan or this two-hour practice plan. Everyone wants to shoot good golf scores, the scores that truly represent what our skills are capable of providing. Whatever score that is, if we come away from the 18th green knowing that we got the most out of every shot, we feel good about the day because we did our best. Sure, there will be a few clinkers in there. We’re human and we’re going to miss a few shots. But what really galls us is when we look over the round and see a hole where we blew a good score, or where we blew up for no reason to make a bad one. “What was I thinking?” is the thing we don’t want to think. So here’s how to not think it. 1. Learn to love your skills and have complete confidence in them, no doubts. Believe without question that they will take you into the scoring range of your choice anytime. 2. When you get to your ball, think through how this shot fits into the easiest sequence of shots that will get the ball in the hole from here as quickly as possible. 3. Before you hit ANY shot, look at it and convince yourself that its only outcome is the best possible shot. This is not an intellectual thing. Feel in in your gut. If you looked at your scorecard, most of you will find that how you score on your best 15 holes represents pretty well how you play. If you had played that way for the entire round, you’d have a pretty good score. Yet, you didn’t carry it through. 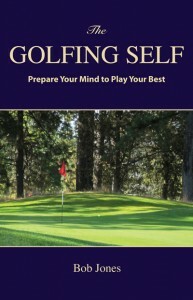 We must train our mind to play 18 holes of golf, not 15 or 16. Everybody, regardless of the level of their physical skills, can learn to do that. Then, as your physical skills improve, the mental skills will already be in place for you to take advantage of your improvement. These aren’t rules from the rule book, but practices you might find on the course where you play. They’re from today’s GolfWorld Monday, and the rules is below followed by my comment in italics. 1. No cell phones on the course, even for texting. Absolutely. For once, give your complete attention to the people who made the effort to spend four hours with you. It’s good manners, the basis of which is that because you can do something doesn’t mean you should. 2. No hats on backwards. Lowers your apparent IQ by 40 points, but if you want your face to get sunburned, that’s OK with me. 3. No women before 10 a.m. on weekends. You’re kidding. Does this still go on? 4. No collarless shirts. Even my $80 Nike shirt that looks pretty darn sharp? 5. No denim. This shouldn’t be a rule, per se, but if the course isn’t a muddy mess, it’s just as easy to wear your Dockers. 6. Hats off indoors. Absolutely. You learned that when you were six-years-old. Or at least you should have. 7. Jackets and ties in the dining room. Boycott the dining room. 8. Guests can’t purchase in the pro shop; must go on member’s account. So my money is legal tender everywhere in the U.S., except in your pro shop? Am I in France? 9. No pull carts. I thought we were trying to get a little exercise here. 10. No cargos shorts or pants. Oh, good grief. How Solid is Your Handicap? I hope you have a handicap, an official USGA handicap. If golf for you is just knocking the ball around every so often, then, maybe it isn’t that important. But if you are a steady player, you should have one. It brings you into the company of golfers by allowing you to enter competitions. 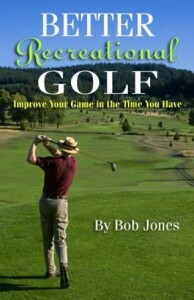 It will show you how much you are improving, you can tell how well you play on courses of varying difficulty, and if you travel abroad, many courses won’t let you on unless you can show them a USGA handicap card. To have an accurate handicap, you should turn in every score, the good ones, and the bad ones. And you keep an honest score, counting the penalty strokes and playing by the rules. If you do, you can say your handicap truly reflects the condition of your game. But does it? There is one other consideration — does your handicap travel? This is the important part. It’s one thing to be a 12 at your home course, which you have learned inside and out. It’s another to be a 12 no matter where you play. A few years ago, a golfer shot a 62 at one of our local courses. He had a 2 handicap and had a day where everything went right. I looked him up on the GHIN Handicap Lookup page, which you can do if you have a name and a state, and found that all of his rounds were played on the same course. Now you can’t argue with a 2. That’s pretty good golf no matter where you earn it. But I wonder how that 2 would stand up if he took his game to some of the other courses in the area that are, quite frankly, harder than the one he’s playing on? I wondered if he shot higher rounds on some of those courses and just didn’t turn them in. Who knows? How well your handicap travels is the factor that makes your handicap legitimate. This isn’t about honesty. It’s about how good are you, really? If you play a rotation of courses, you now that certain courses demand shots that are different from other courses. One course I play is a first-shot course. Get your ball in the fairway, and you’re home free. Of course, that isn’t easy to do, and a price for missing is paid. Another course has high rough around the greens that demands chips I never hit anywhere else, and so on. I would suggest, as a general rule, that you the twenty scores in your handicap mix should at any time be made on at least four different courses, and the ten scores that determine your handicap should come from at least three. That would give you the assurance that when you go to a new course, you won’t get a big surprise by finding out there are big holes in your game. This will also give you the joy of rounding out your game, and knowing that wherever you go, there isn’t a challenge you can’t handle. If you don’t have a handicap, join a club to get one. The USGA’s definition of a club is quite permissive. It doesn’t necessarily mean an expensive membership in a private or semiprivate club. Your local muni should have a mens’ club or women’s club you can join for maybe $40 per year, and you’re all set.